Vientiane, can be a tough nut to crack for the newly-arrived expat living in Vientiane, Laos. 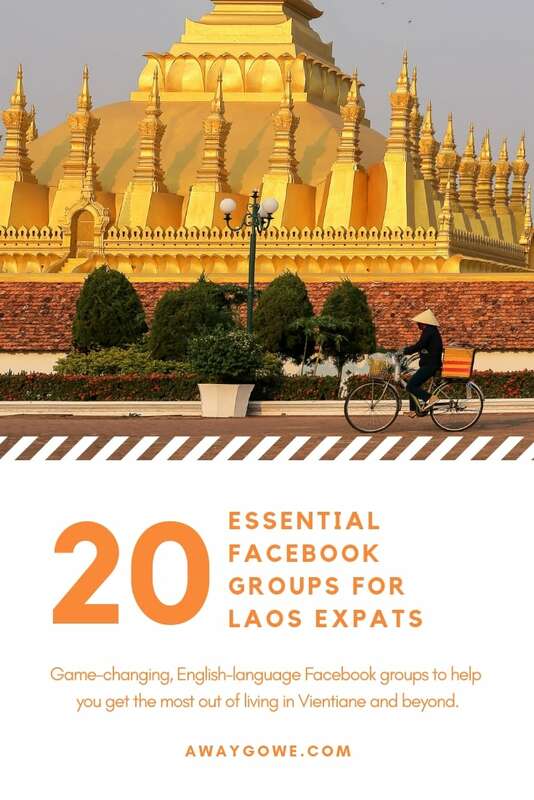 Here are 20 game-changing English-language Facebook groups to help expats get the most out of living in Laos’ unique and often perplexing capital and beyond. The Mac Daddy of English language FB social groups in Vientiane, if expats living in Vientiane are talking about it, you can bet it will be on Vientiane Social. A group which keeps you updated on what’s happening in Vientiane. Feel free to post events and what’s happening in town and invite your friends. There are several Laos buy/sell groups on Facebook, but few come close to matching Buy & Sell in Vientiane’s 20,000 [active] members. Websites like Craigslist haven’t yet caught on in Vientiane, so Facebook groups continue to fill the gap, particularly among English-speaking expats living in Vientiane, as it can often be challenging to track down items or recognize “For Sale” signs around town without a fair amount of Lao language skills. The premier Facebook page dedicated exclusively to English-speaking expats living in Laos (and those thinking of moving to Laos). Have you made Laos your new home? Are you thinking about moving to Laos ? If you want meet like minded Expats living in Laos then you have come to the right place. Discuss food, shops, services; meet friends, talk finances, jobs, internet & phones, and much much more. There is no such thing as a stupid question. Someone else is already wondering about the question you’re about to ask. Beat them to the punch. If you’re here on AwayGoWe, there’s a decent chance you might be a parent. And…if you’ve gotten this far down the list, there’s a good chance you might live (or be thinking of living) in Vientiane. Right on! Okay then. Here’s a group just for you. Though, for us dads, I will admit the group can be a bit mom-centric. Not the fault of the group as much as lack of participation from dads, perhaps? Either way, it’s a great resource for anyone living in Vientiane with little ones. If you’re planning a move to Laos (or are already an expat living in Vientiane, but looking to move into a new place), Rent & Let in Vientiane is a great place to start, with often several properties posted daily from across the city. Find short or long term housing, house shares, apartments, roommates, and list your place for rent. If you plan on moving to Vientiane (or anywhere in Laos, for that matter), you may be thinking of getting yourself a car. While cars in Laos are wildly expensive compared to other countries in the region (largely due to exorbitant import taxes, scarcity of older vehicles, and the absence of domestically-produced passenger vehicles), there’s always something available for those willing to shell out some cash (generally copious amounts of USD). If a motorbike is more your thing (as is the case for the majority of people in Laos), Buy & Sell in Vientiane (see above) might be a better bet. Another buy/sell group for cars (and vans), but specific to the Vientiane capital region (and public, for those who might not make the cut with Car Buy&Sell in Laos…). Newcomers to Vientiane are often stunned by how far behind the city remains in recycling efforts or how little information is out there regarding existing efforts. In response, a handful of online communities have popped up. Got a question about recycling efforts in Vientiane? Post it on Vientiane Recycling. As many locals (and expats living in Laos as well) will tell you, Laos is a land rich in cultural heritage, from history, stories, and dance, to music, food, and festivals. If you’re a new-comer (and not conversational in Lao language yet), Lao modern and folk culture can be challenging to access or understand, as there don’t yet exist a lot of public outlets. Culture and Stories from Laos can help bridge the divide and feed your curiosity. It’s no secret that Lao food is amazing, but where to grab amazing Lao food (or just plain great food of any ilk) can seem like a huge secret for the newly arrived. Enter Vientiane Foodies, for those who love food, and who love food lovers. If you like to eat, you might also like to cook, too. Cooking in Laos can be easy to difficult depending on what exactly you’re trying to cook. Particularly for Western dishes, ingredients can be hard to find. Concept Cooking in Laos is an exchange for people looking for cooking ideas using local ingredients, trying to track down a hard-to-find ingredient, or just want to talk about cooking in Laos. Vientiane is one of the safest cities you’ll likely find yourself in. But, like any city, stuff happens. This Facebook group lets you stay up to date on crime and other safety issues in real time, through first-hand accounts of incidents. Image credit: Facebook / Where Can I Find…. Vientiane? Where Can I Find…. Vientiane? We could spend countless hours ruminating over the philosophical answers to this question, but this Facebook group is purely concerned with the practical. And there really isn’t a more practical question in Vientiane. Because, let’s face it, stuff (particularly for an expat living in Vientiane) can be really difficult to find here. No addresses, no websites for brick-and-mortar retailers (with a few exceptions), no yellow pages, and stock is constantly changing. In fact, shops and service providers are constantly changing too, it seems. Here today, gone tomorrow. At least there’s an online community devoted to helping you find what you’re after…before it disappears, that is. Looking to stay fit in Vientiane but don’t know what your options are? Want to join a sports team? Vientiane Sport and Fitness is your answer. There aren’t a ton of English-language resources in Laos for keeping up on the news. If you want the news straight from the horse’s mouth, Laos News is a good place to start. While this group can’t compete with Buy & Sell in Vientiane’s 20,000 members, it’s still a great place to look for that elusive second-hand item you crave (or to tap a wider market beyond Vientiane for selling your own stuff). Found something weird and/or beautiful in your yard while gardening? Find out what it is, and more! Want to pick up a new skill during your time in Laos? Find someone (or some place) offering courses on anything from Lao to break dancing, driving to first-aid, and everything in between.